BAYARD, James Asheton, Sr., (father of Richard Henry Bayard and James Asheton Bayard, Jr., nephew of John Bubenheim Bayard, grandfather of Thomas Francis Bayard, Sr., and great-grandfather of Thomas Francis Bayard, Jr.), a Representative and a Senator from Delaware; born in Philadelphia, Pa., July 28, 1767; graduated from Princeton College in 1784; studied law; admitted to the bar in 1787 and commenced practice in Wilmington, Del. 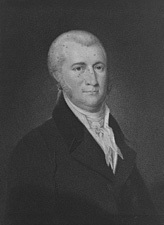 ; declined the appointment as Minister to France tendered by President John Adams in 1801; elected as a Federalist to the Fifth, Sixth, and Seventh Congresses (March 4, 1797-March 3, 1803); unsuccessful candidate for reelection in 1802; one of the managers appointed by the House of Representatives in 1798 to conduct the impeachment proceedings against William Blount, a Senator from Tennessee; elected as a Federalist to the United States Senate in 1804 to fill the vacancy caused by the resignation of William Hill Wells; reelected in 1805 and 1811 and served from November 13, 1804, to March 3, 1813, when he resigned; appointed a member of the commission to negotiate peace with Great Britain in 1813; aided in negotiating the Treaty of Ghent, signed in December 1814; declined the appointment as Minister to Russia tendered by President James Madison in 1815; died in Wilmington, Del., August 6, 1815; interment at Bohemia Manor, Cecil County, Md. ; reinterment about 1842 in Wilmington and Brandywine Cemetery, Wilmington, Del. American National Biography; Dictionary of American Biography; Borden, Morton. The Federalism of James A. Bayard. 1955. Reprint. New York: AMS Press, 1968; Donnan, Elizabeth. Papers of James Asheton Bayard, 1796-1815. 1915. Reprint. New York: Da Capo Press, 1971.